Excuse me whilst I pick my chin off the floor. I’ve waited my whole lifetime for Jennifer Aniston to wow me, and she does wearing this Prada Spring 2009 silver metallic crushed dress. What I love about this look the most is the confidence she exudes. It’s oozing from every pore and for me that’s more captivating than the colour and the cut. Jen could have gone for the safer runway dress as it’s in her favourite colour – Black, but she not only opted for the silver dress, but a shorten silver dress plus she didn’t press it like Nicole Kidman did. This may not sit well with Jennifer Aniston’s loyal fans as this is such a huge departure from her usual style, but I love it. Oh and I hate to be crude, but where did those twins sprout from? This is the first time in a long time that Amber Valletta has proved her supermodel status. She hasn’t impressed me much on her last few outings, but she works it out in this maroon sequined Proenza Schouler 2009 Pre-Fall dress. I love the colour the cut-outs in the shoulders, and the contrast exposed zipper at the back. She completed her look with her hair tied back with sweeping bangs, whilst wearing black patent Brian Atwood “Maniac” pumps and carrying a feathered Raven Kauffman Couture clutch. Like Jennifer Aniston, I would have bet on Jodie Foster picking the black runway version of this Giorgio Armani Fall 2009 dress. But instead she wore a grey satin, shadow-print version with complementary strappy sandals and clutch. Her dress is exquisite with the origami folds on the bodice, and the daring low cut. I love that these women are stepping out of their comfort-zones at this event. Chelsea Handler wore a two-tone Lanvin Spring 2009 dress, with satin champagne strappy heels. We’re not used to seeing Chelsea this polished and spectacular, but she pulls this look off with great aplomb. I hope she keeps up this sophisticated style of dressing, as I could really warm to her. Mary McCormack tried to bring this grey strapless Yves Saint Laurent Spring 2008 dress up-to-date with a cage belt and YSL Trib Two’s. It’s a nice look, but we’ve seen this dress so many, many, many times before. Michelle Trachtenberg wore a Reem Acra knee-length dress covered in gold sequined leaf details and a contrasting waist band. Her dress which she wears with black open-toes heels is nice enough, but it feels a bit too old for her. Jenny McCartney looked out-friggin-standing wearing this crisp white pant suit. Even though she has been dressing so sophisticatedly for a while now, I’m still always surprised at her fabulous looks. Hair, make-up earrings, clutch, everything is perfect. My only bug-bear are her extremely long pants. I hate the thought of them picking up dirty as they drag on the floor. Of all these looks Dania Ramirez’ is the one I would definitely purchase to go shopping at the mall on a sunny day. I love this summery look with the white tube top, floral tulip skirt and purple accessories, but it’s feels too casual for the red carpet. Terri Seymour showed off that enivalbe figure wearing a coral RM by Roland Mouret Fluro dress with pleated neckline knee-length dress, paired with black patent pumps. Selena Gomez wore a simple black H&M tank dress, with equally simple black pumps. Elizabeth Banks set the bar really high for her red carpet looks during Cannes Film Festival, but I’m not really enjoying this look on her at all. Her sparkling MaxMara dress is nice enough, but I have never been a fan of a sheer yoke. Reminds me too much of ice-skaters. The actress completed her look with satin black pumps and a matching clutch. 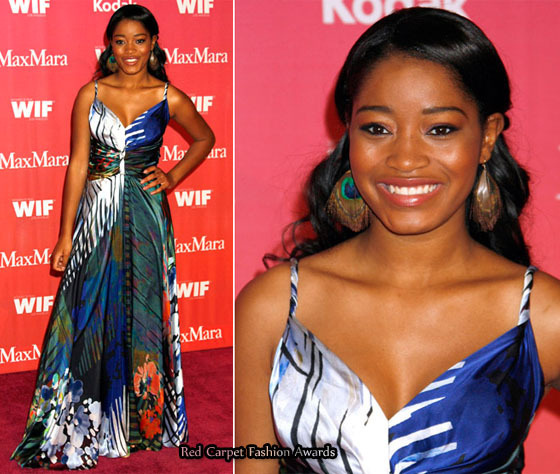 Keke Palmer wore a printed maxi dress, which she accessorized with peacock earrings. I really don’t like this dress as too much going on with the clashing prints plus those earrings are just hideous and so unnecessary. Lynn Collins’ invite must have said fancy dress. Christina Hendricks has such a stunning figure, and she embraces colour in many of her looks. With that said I can’t help but be really disappointed with her all black, all boring look at this event, when so many women really step it up a notch.